For more craft tutorials, recipes and tips & tricks, subscribe to my newsletter! I recently sat down to make a burlap wreath and really struggled through a few online tutorials before realizing I needed one that was a little more detailed–I’m not too crafty. 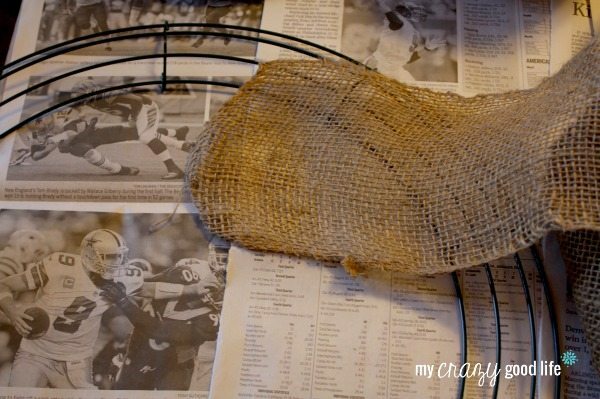 Here’s my ultra-detailed burlap wreath how-to, for those of you like me who need a bit more help. 1. 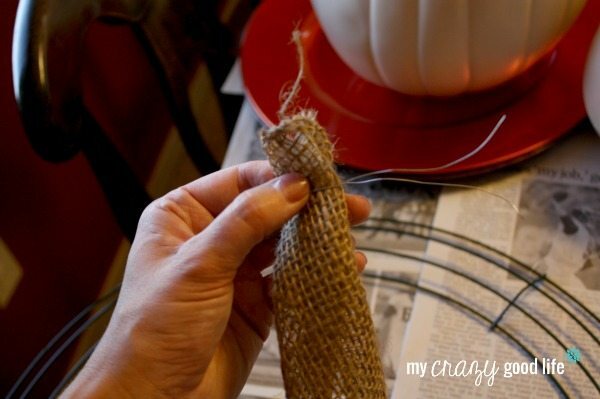 Fold the top of a small section of burlap into thirds. 4. 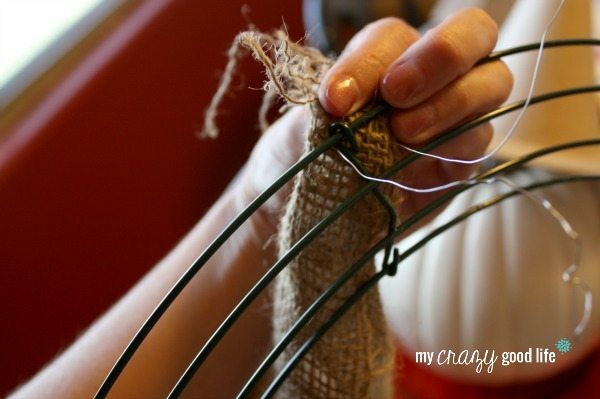 Weave the burlap in and out of each of the three sections of the wire wreath, leaving 4-5 inches outside the wire. Don’t stress about the way it looks right now! You’ll go back and “fluff” when you’re done. If it’s easier to work with the burlap, you can cut it into sections. 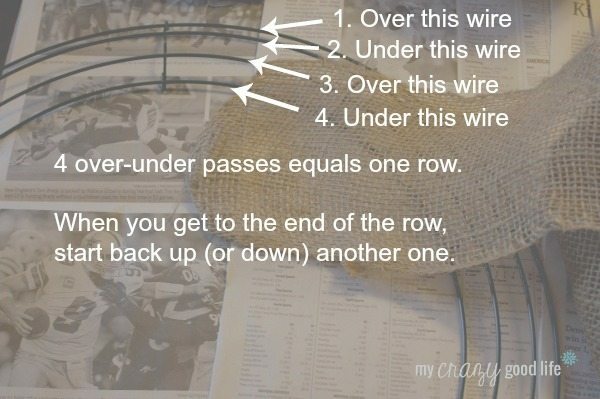 Just remember that for each section you do, you’ll have to begin at step 2 with floral wire. 5. You can add more rows per section for a fuller wreath or less for a thinner wreath. Mine is thinner. 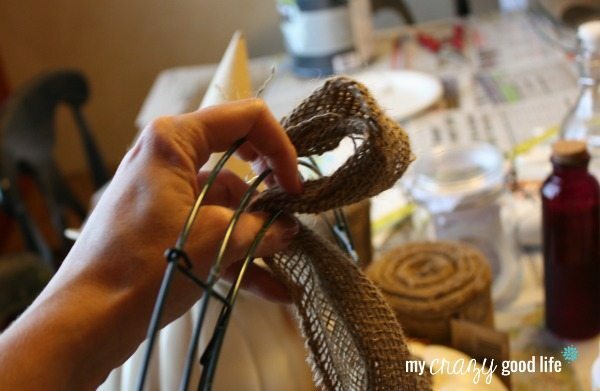 When you come to the end of the wreath, cut the burlap and secure the end to the wire wreath with floral wire. Don’t forget to fluff! That’s how I was feeling, Heather! I need simple! So cute. I love this style of wreath, especially since it lends itself to being reused for different holidays. Might need to craft one of these up myself. Great Burlap work! I am one of those people that needs it clearly explained. I too had a hard time reading and figuring out those instruction! Thanks for making it soooo clear! What size of wire wreath did you use? I have a smaller 12″ one that I need to use so I’m trying to see how much burlap I would need for it. Awesome tutorial! By far the best one I have found for this type of wreath! Thank you for sharing! From edge to edge, the outside of my wire wreath is 18 inches – I have only seen them in this size so I didn’t even think to mention the size of the wreath (like I said, I’m not very crafty!). Good luck with your wreath! Thank you. I think I can do this! I’ve been seeing these on Pinterest and really want to try. Your tutorial will help a lot! Thanks, Amy! And good luck! Thanks so much for your tutorial, Joanne’s fabric had a good coupon this week so I got the materials and made this, without your help I couldn’t have done it! Thanks so much! Great tutorial, Becca! 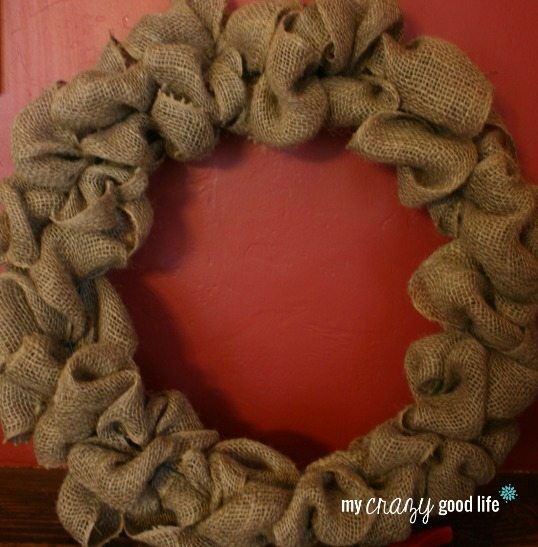 I’ve never made a burlap wreath myself, you make it look so easy! Thanks so much for sharing at our Get a Your DIY on Party. I hope you can join us again tonight for furniture revivals week! Easiest instructions, by far, I have seen yet. Your diagram of the “under and over the wire” helped me understand the inner structure of the wreath. Thank you so much for sharing this information. hi, beautiful wreath!!! Im wondering for the over and under that you do with the burlap,,,do you pull through the 30ft of burlap? Meaning each time you do an over and then an under with the burlap you pull through all of your long piece of burlap, correct? Me and my sister are planning a wreath making day! 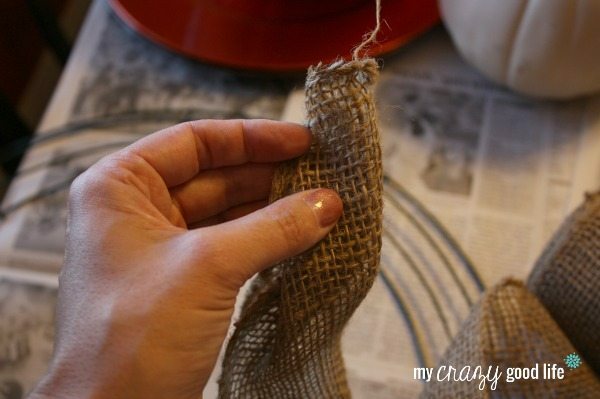 You could cut it in half and just do the first steps to secure the burlap twice! I did pull it all through, but now that I know what a mess burlap makes, I’d chunk it into smaller sections. 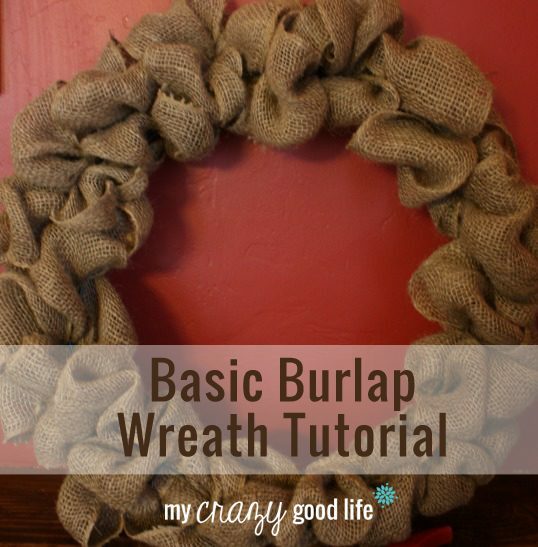 Do you leave the burlap folded in thirds for the whole wreath? I didn’t fold the burlap–it’s just one piece that covers the entire wreath. Does that make sense? I wish I made a video now–it’s not easy to explain! Yes, it makes sense. Thank you! I am working on it now and I can see the wreath frame so I think I need to fluff it up more. Thank you SO much! With the other websites, I kept scrolling up and down thinking ‘Did I miss a step?’ This was exactly what I needed! Love it! Easy! Well explained! I just made mine (nice to have all materials on hand) and it looks quite nice I must say ;) I didn’t forget to fluff!